The only watch worn on the moon! The OMEGA Speedmaster Professional Chronograph has the unique claim of being the only watch to survive NASA’s two-year programme of extreme tests to find a chronograph suitable for its astronauts on their space missions. As a result, it was the first – and until now only – watch ever to be worn on the moon, when Man landed there on 21 July 1969 at 02:56.20 GMT. The latest incarnation of this legendary watch has a scratch-resistant sapphire case back and crystal. Only thanks to OMEGA’s considerable expertise in watchmaking did the Speedmaster Chronograph pass NASA’s stringent tests to be flight-qualified for all manned spaceflight missions. The key to its success were the small trade secrets used in the movement design, as well as the top quality components used in the manufacture of the watch, such as the highly resistant acrylic crystal used on the original model – a crucial component on the watch that proved a stumbling block for its main competitors in the two-year tests in 1964/65. One of the biggest advantages of this crystal for use in space is that if it is broken or smashed, it does not shatter into tiny pieces. This is important, since such tiny fragments of glass floating around in zero gravity would represent a considerable safety risk. The movement calibre 861 that equipped the original Speedmasters is still used in the collection today. 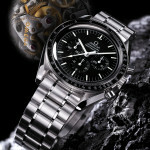 Though, like all OMEGA movements, it employs the very latest technical standards, it still retains its original design. This is hardly surprising, since this calibre is one of the masterpieces in watchmaking history. The fact that the Speedmaster Professional Chronograph is still today qualified for extra-vehicular activity by NASA and chosen for the same purpose by the Russian space agency is testament enough to the extraordinary reliability of this movement, found in the Speedmaster Professional today as calibre 1863: a manual winding chronograph with a power reserve of 45 hours. The hand winding chronograph is the only suitable mechanism for extra-vehicular use, since the functioning of the rotor in a self-winding movement would be compromised in the vacuum of outer space. The design of the “Moon Watch” retains the same classic look it had in the 1960s, with its black dial with luminous hour markers, luminous hands and stainless steel bezel with a black aluminium ring bearing the tachymeter scale, which allows calculation of the speed of a moving vehicle or the hourly output of a machine. The Speedmaster Professional line is enhanced by a version with a scratch-resistant sapphire crystal and transparent sapphire crystal case back, revealing the movement in all its glory and bearing the inscription “The First and Only Watch Worn on the Moon”. This exclusive timepiece is water resistant to 30 metres and is available with a stainless steel bracelet with safety clasp or a black alligator leather strap with foldover clasp. The Speedmaster Professional Chronograph’s less-famous claim to fame is that was also the last watch to be worn on the moon, leaving the Earth’s natural satellite with the Apollo XVII mission for the last time at 22:54:37 GMT on 14 December 1972. As we prepare to celebrate the 30th anniversary of this historic event, the Speedmaster legend is still going strong, with the commander of the final Apollo mission, Capt. Eugene Cernan wearing an OMEGA Speedmaster to this day! This entry was posted in Press Release, Speedmaster Professional and tagged 3573.50.00, Moonwatch on April 4, 2002 by Dale Vito.